(CNN) -- Jaycee Dugard kept a journal during 18 years of captivity, at times writing about how she yearned for freedom, court documents filed Thursday reveal. "It feels like I'm sinking," she wrote in 2004, when she was 24 and being kept with her two daughters in the backyard of Phillip and Nancy Garrido's northern California home. "I'm afraid I want control of my life," she wrote. "This is supposed to be my life to do what I like." A journal entry a year earlier reads, "How can I ever tell him I want to be free? Free to come and go as I please. ... Free to say I have a family. I will never cause him pain if it's in my power to prevent it. FREE." The entries were revealed in court papers filed by prosecutors, who are trying to keep Dugard's current location from the Garridos and their lawyers. A hearing is scheduled on February 26. 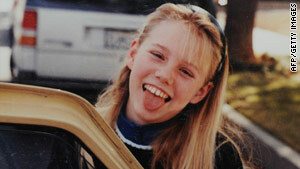 Dugard was 11 when she was abducted in 1991 from the street in front of her house in South Lake Tahoe, California. She was 29 when she was found in August at the Garridos' home in Antioch, about 120 miles away. The Garridos were charged with her abduction, and Phillip Garrido, 58, is also charged with sexually abusing her. Both have pleaded not guilty to the charges. Prosecutors allege that Phillip Garrido's attorneys are attempting to contact Dugard, and she wants nothing to do with them. They contend he has been trying to send a signal to her not to cooperate. It is clear that the defendant is attempting to use the media and his own attorneys to continue to control [her]. "It is clear that the defendant is attempting to use the media and his own attorneys to continue to control [her]," Deputy District Attorney James Clinchard wrote in the court filing. The prosecutor repeatedly referred to Dugard as "Jane Doe" or "Ms. Doe." Phillip Garrido's lawyer, Susan Gellman, said she was just doing her job. "For the District Attorney to hint that it is somehow improper or nefarious is disingenuous to say the least," she said. "I am not the 'tool' of any man." But manipulation and control were themes prosecutors struck repeatedly in their court papers, which refer to Garrido as "a master manipulator." They cited an earlier journal entry, written when Dugard was 13, that they allege shows a young girl under her captor's spell. "I got [a cat] for my birthday from Phil and Nancy," she wrote in July 1993. "They did something for me that no one else would do for me, they paid 200 dollars just so I could have my own kitten." But in later entries, she wrote of her frustration with her situation. "I am afraid he doesn't see how the things he says makes me feel like a prisoner," she wrote in July 2004, about 13 years into her captivity. "Why don't I have control of my life! I feel I can't even be sure my daughters are my own." According to the court documents, Garrido first sexually assaulted Dugard on the day she was abducted. She was pregnant for the first time at age 13, and gave birth at age 14. She was pregnant with her second child at 16 and gave birth at 17. The girls, who were 11 and 14 when they were found, were named Angel and Stardust. In their court papers, prosecutors objected to Phillip Garrido's attempt to arrange visits with Dugard's daughters. "Incredibly, the defense attempts to support their motion with claims that 'the children were raised as the children of Nancy and Phillip Garrido and all five held themselves out to be a family,' " the prosecutor wrote. Also in their court papers, prosecutors took exception to Garrido's statements to the media that he had a heartwarming family story to tell. He has told media outlets that his family went to the library together, ran a business, took vacations, kept pets and tended a vegetable garden, the court papers state. "Incredibly, the defense fails to recognize that [Dugard] and her children were not their 'family' but were in fact captives -- they were victims," prosecutors wrote. The papers revealed new details about Dugard's years in captivity behind the Garridos' ramshackle home. During her first year of captivity, Dugard never left the shed where she was held. She didn't leave the backyard for the first four years. Last month, the defense wrote Dugard a letter, according to court declarations from District Attorney Vern Pierson and Clinchard, a deputy prosecutor. "Mr. Garrido has asked me to convey that he doesn't harbor any ill will toward [her] or the children and loves them very much," the letter stated, according to Pierson's declaration. The letter upset Dugard, Pierson wrote, adding that she told him she saw it as "another way of manipulating" her.